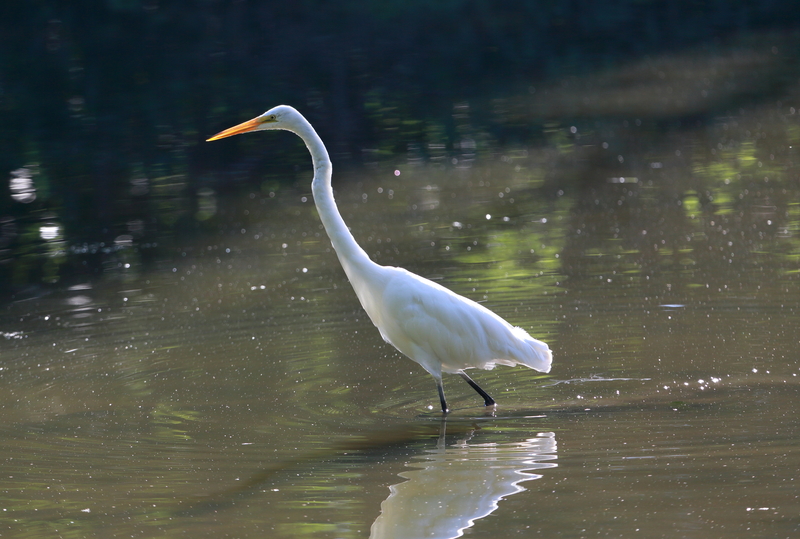 Even if there is not much in the way of birds to see or photograph – a distant Baltimore Oriole, a flock of blackbirds flying by – I am still committed to going somewhere every Sunday morning, weather permitting. It has become part of my routine. Routine is great to fall back on when I feel unfocused, overwhelmed or just plain lazy. 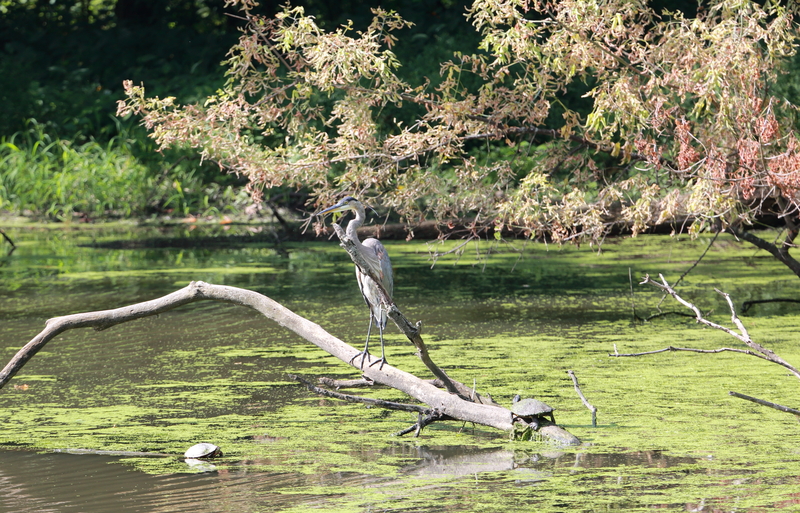 So last Sunday I decided to visit Lake Katherine again, and then hop over to McGinnis Slough, which wasn’t far. The forecast was for rain in the afternoon, which in reality never happened. 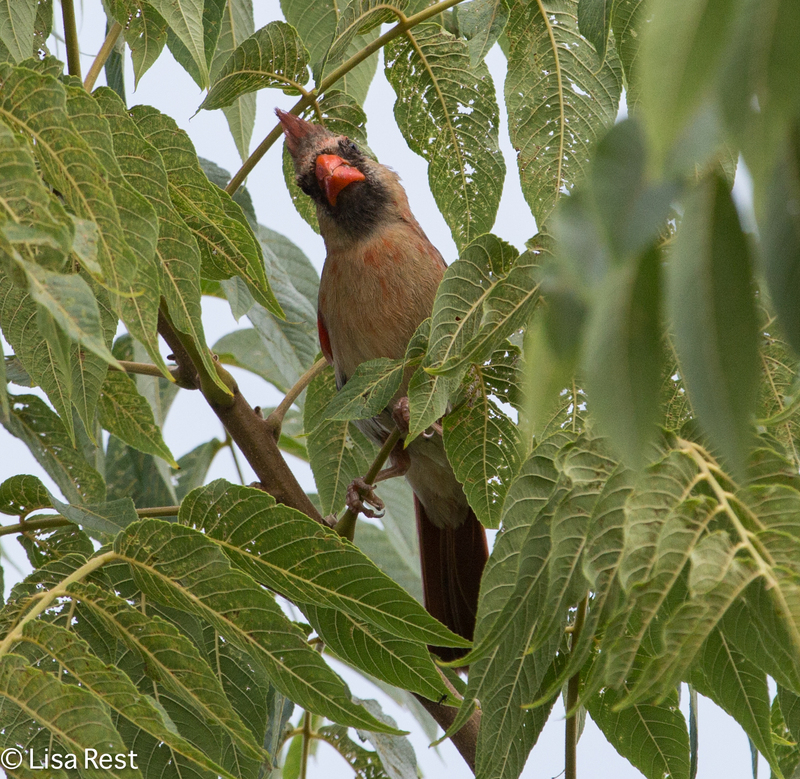 The first bird near the parking lot was this skeptical-looking female Northern Cardinal. I decided to skip the garden portion and walk around the lake. 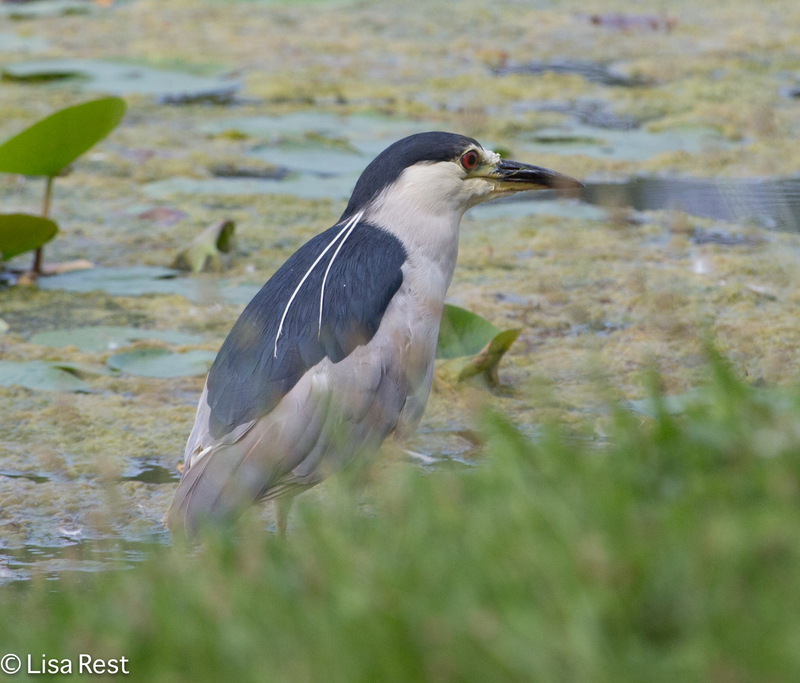 The first bird to record was likely the same Black-Crowned Night Heron I saw a couple weeks ago in the trees. 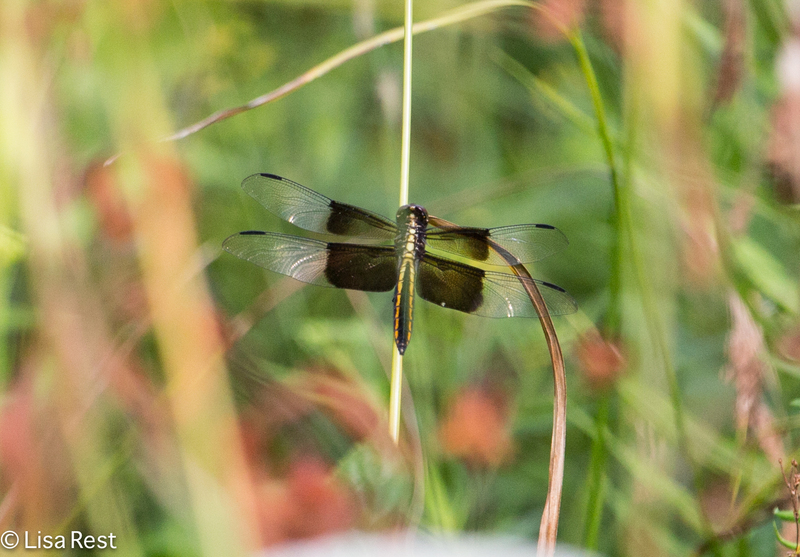 Although his attempt to hide behind the grasses seemed successful to me, he wasn’t pleased with it and he took off before I could snap a picture of him in flight. 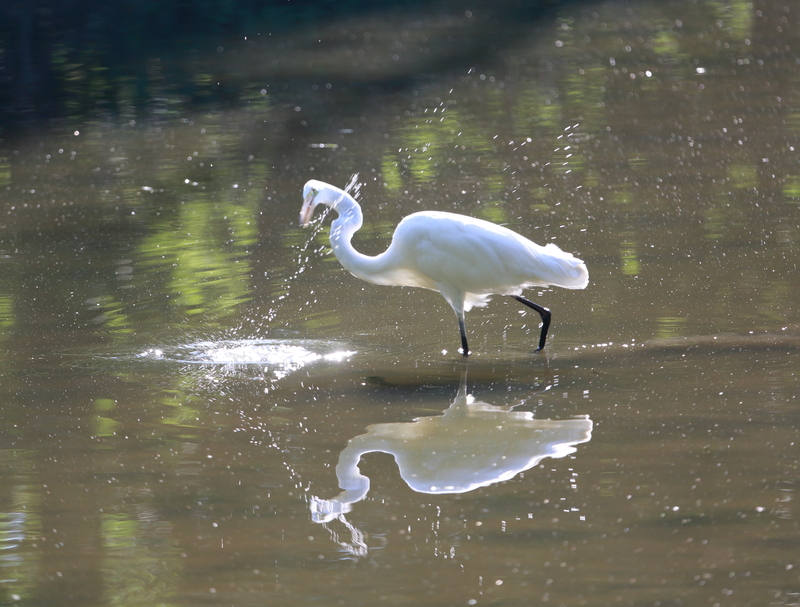 When I am the cause of a bird’s flight, I don’t like to photograph it anyway, I feel too much like I’m taking advantage of the situation I created. 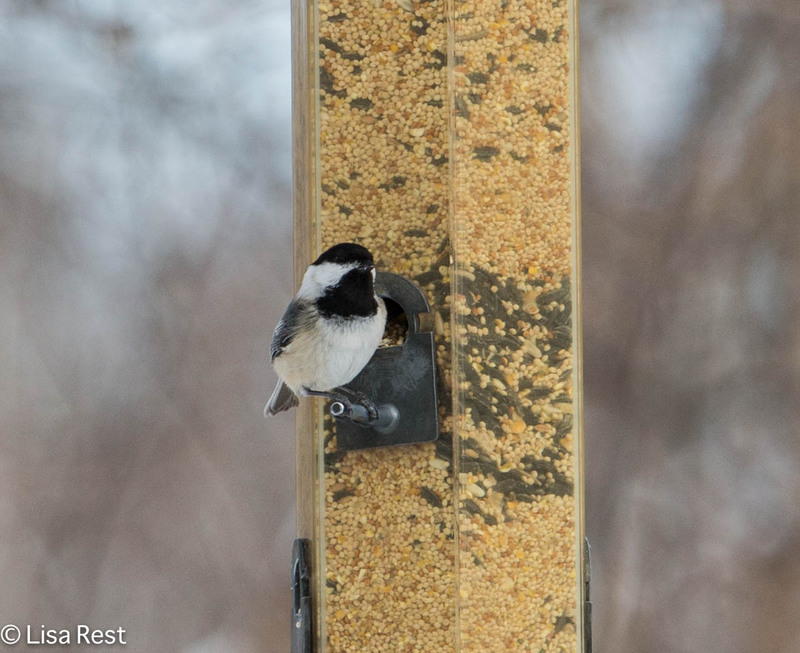 Not to mention that usually the bird is gone long before I can get myself organized enough to capture it. It was a cloudy day which made it difficult to photograph anything in flight, actually. 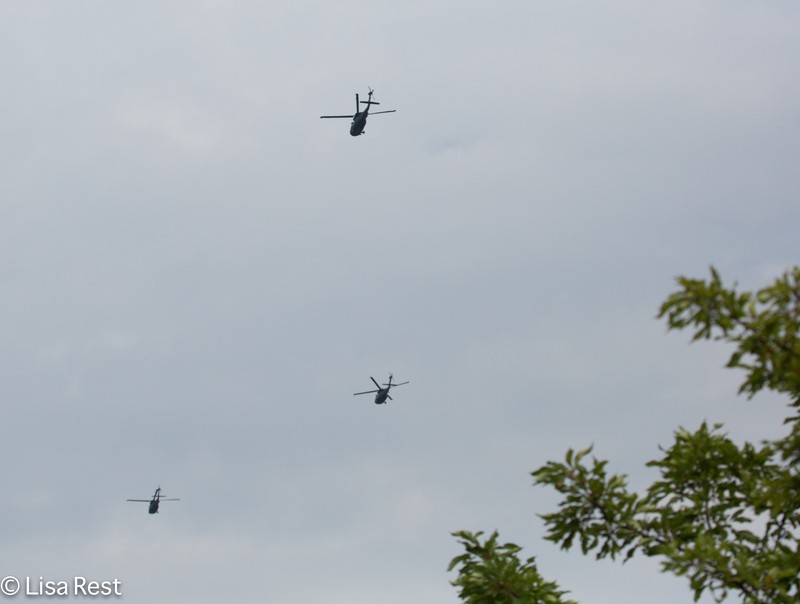 But these three helicopters sure were noisy. 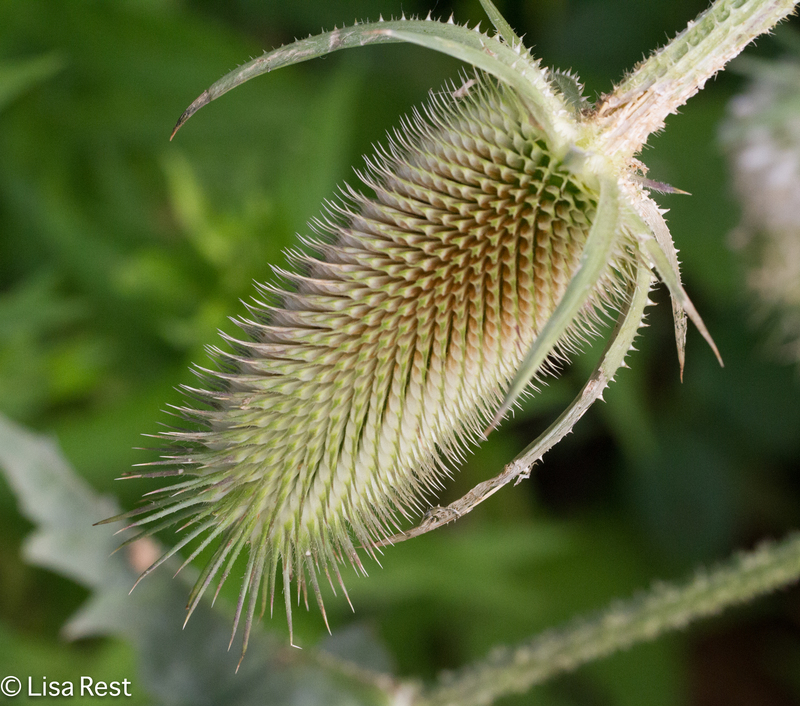 Back on the ground, taking note of dragonflies, a Sphinx (“Hummingbird”) Moth and the geometry of a completely stripped thistle blossom. Juvenile Mallards as big as their parents and at this time of year, looking much the same. 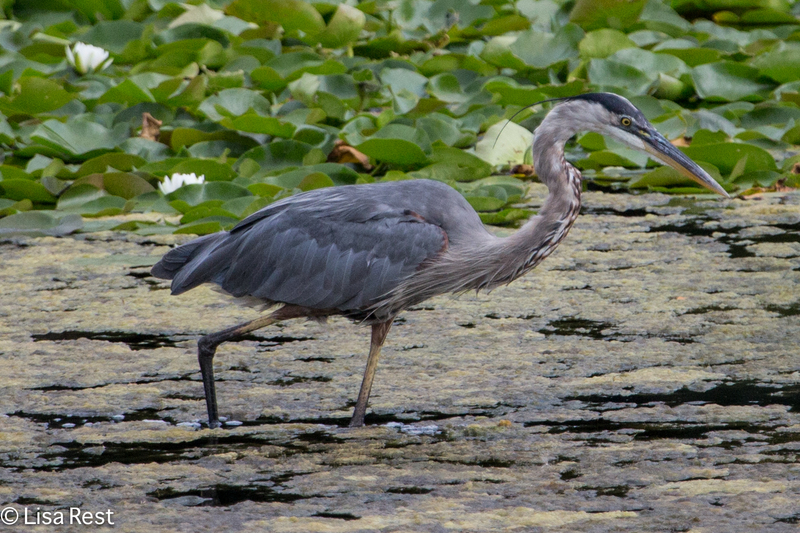 There was a Great Blue Heron stalking prey, but after taking maybe 15 pictures of him crouched low, I grew tired and never did see him catch anything. 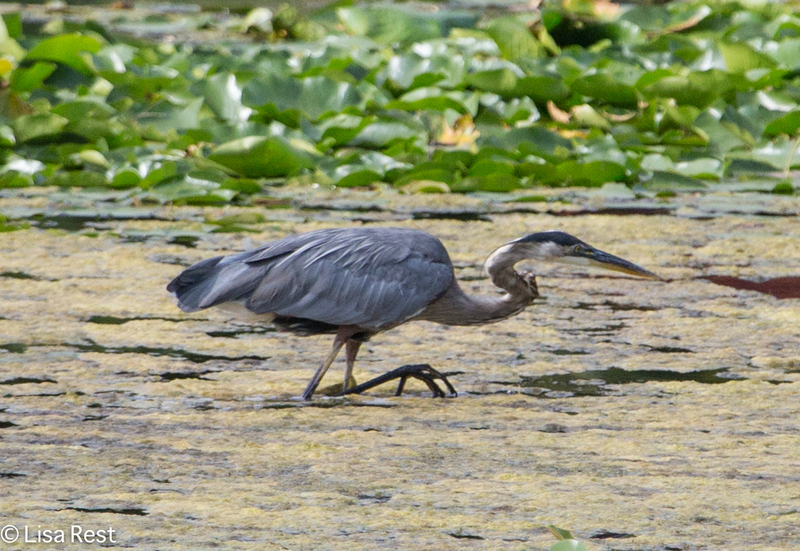 The heron was a bit closer when I got around to the other side of the lake. 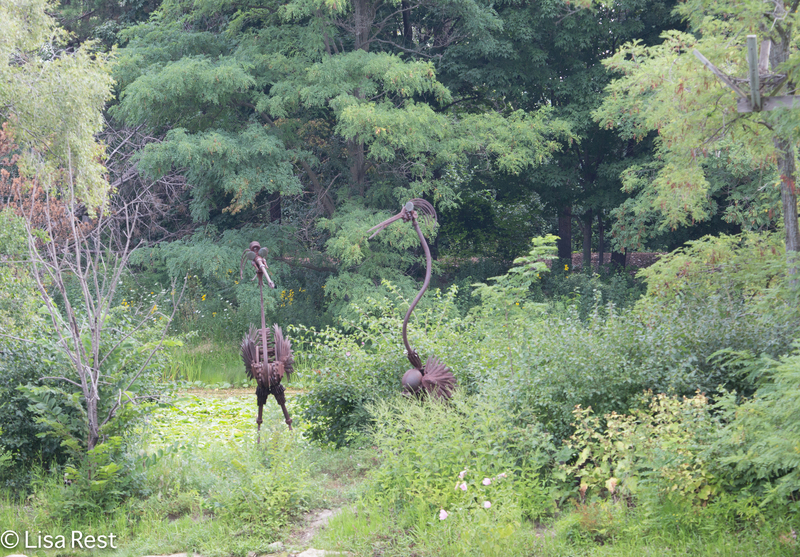 In the middle of the lake is a small island, and in addition to two small rookery platforms which I did not photograph, there are heron sculptures which looked a lot more interesting. But my attention to the island was first drawn by a bright orange bird on the other side of it. It’s a Baltimore Oriole that hasn’t left yet. 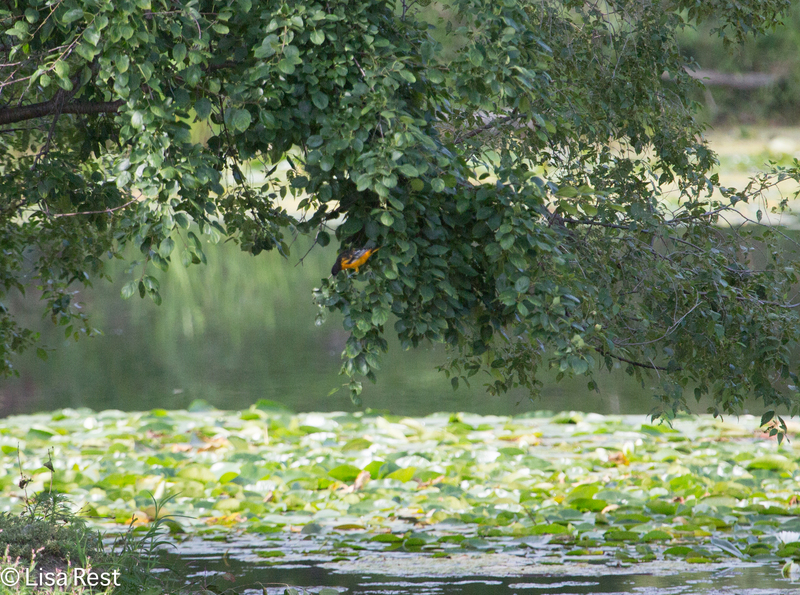 Unfortunately it was too far away to photograph, but I like the branches hanging over the pond lilies anyway. 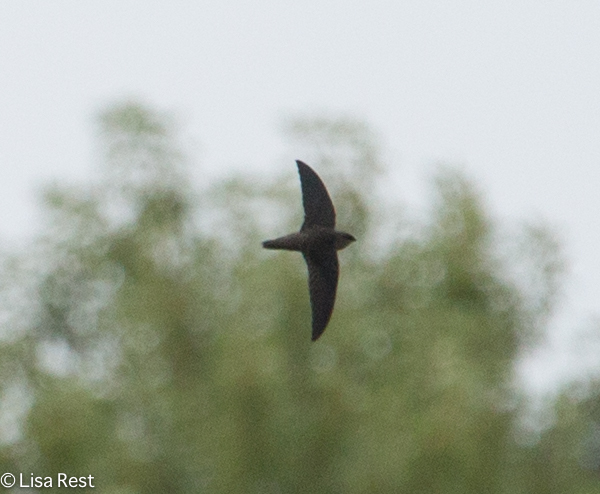 Lots of Chimney Swifts, which are impossible to follow, but they were so close, I had to try. At least I got one flying cigar photo. 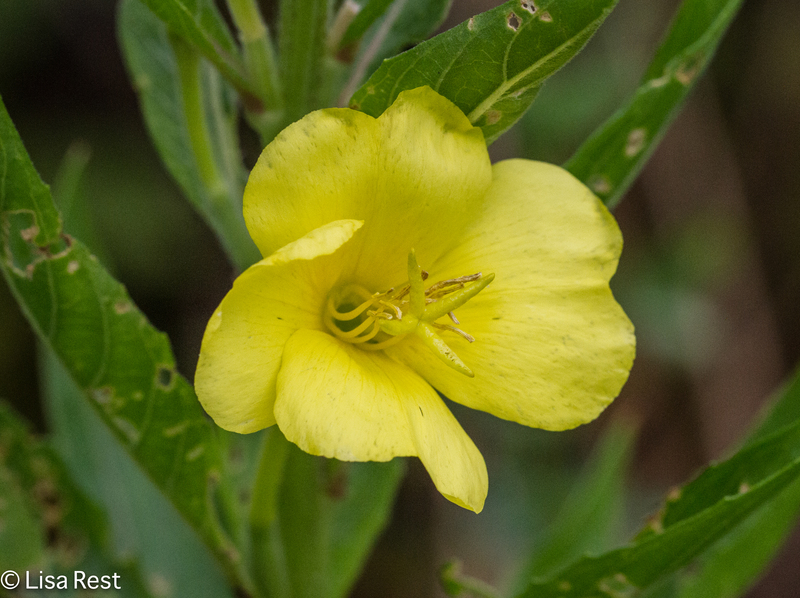 I believe the flower below is a form of evening primrose, of which I understand there are an unbelievable number of varieties. Anyway it looks similar to what has taken over part of my yard. 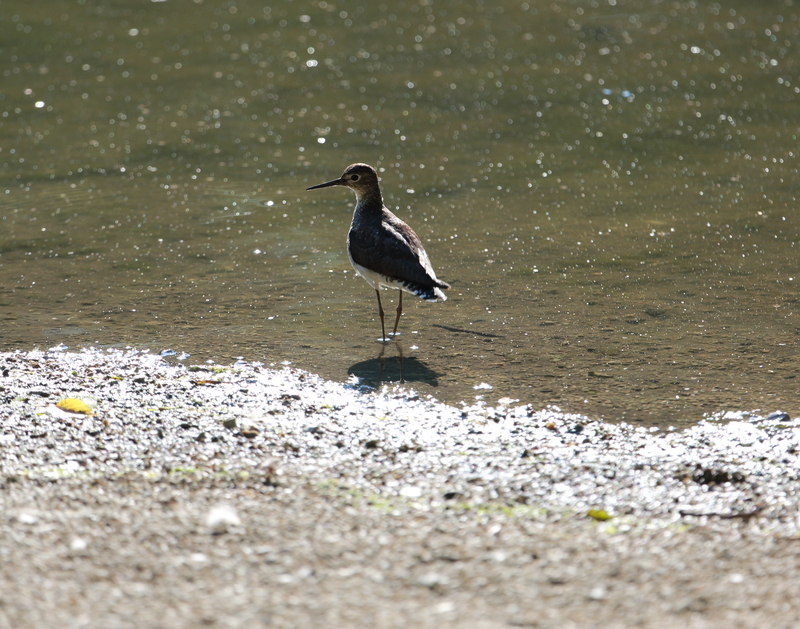 By the time I got to McGinnis Slough, it was 10:30 AM or so, which is getting late by bird standards. There was not an awful lot happening. 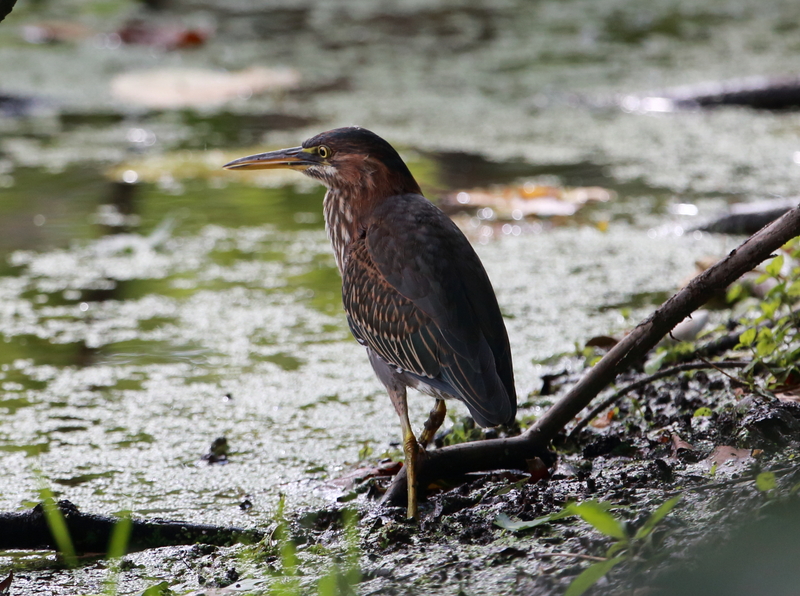 Maybe the best bird was a very close Green Heron, but with the clouds and backlighting, it doesn’t appear colorful at all. It’s impossible to look out on whatever water there is at McGinnis without a scope, so I did the obligatory scan and counted some Pied-Billed Grebes, Great Egrets, Great Blue Herons, Double-Crested Cormorants, and I forget what else – I still have to input my ebird list – there wasn’t much. 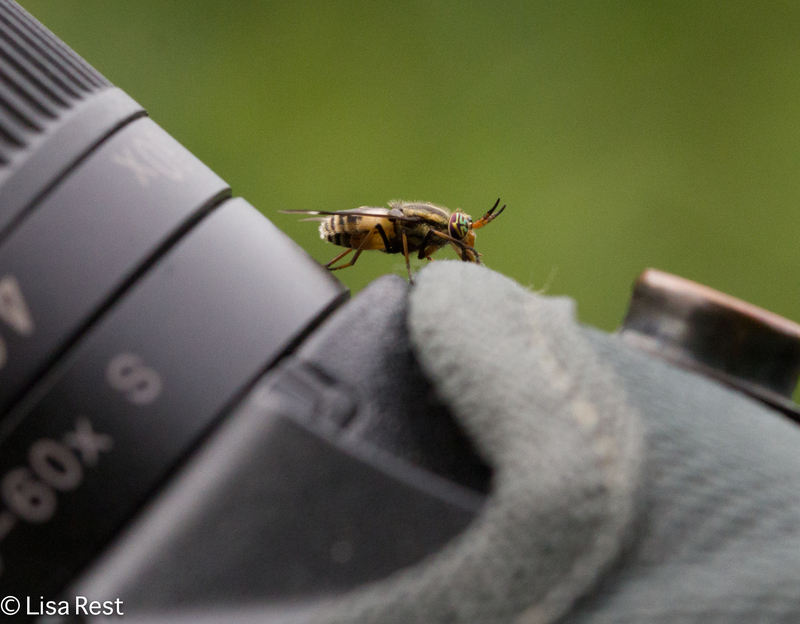 But there was a Deer Fly who was fascinated by the scope cover. Better the scope cover than me. 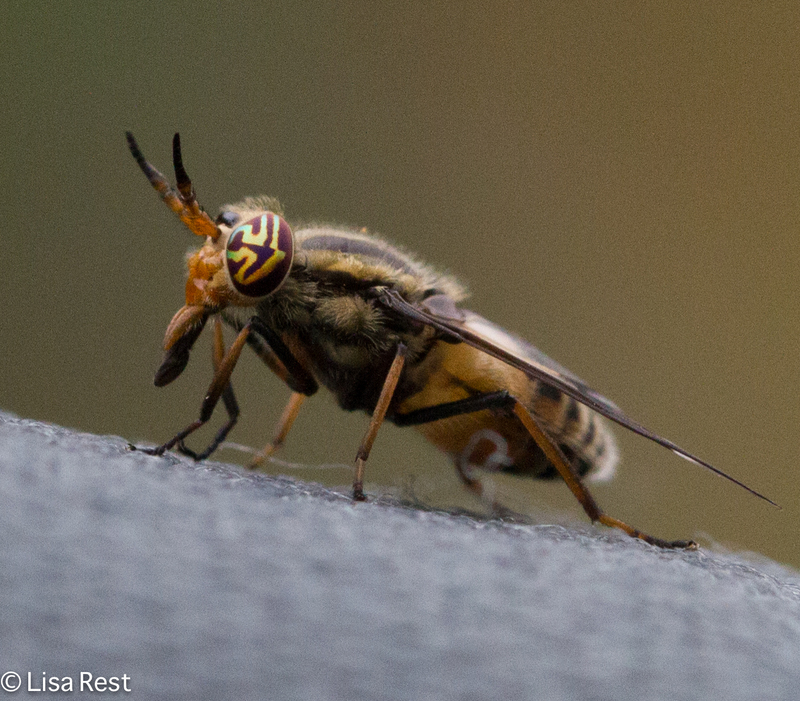 I am usually swatting at these things, but this one was a model insect. 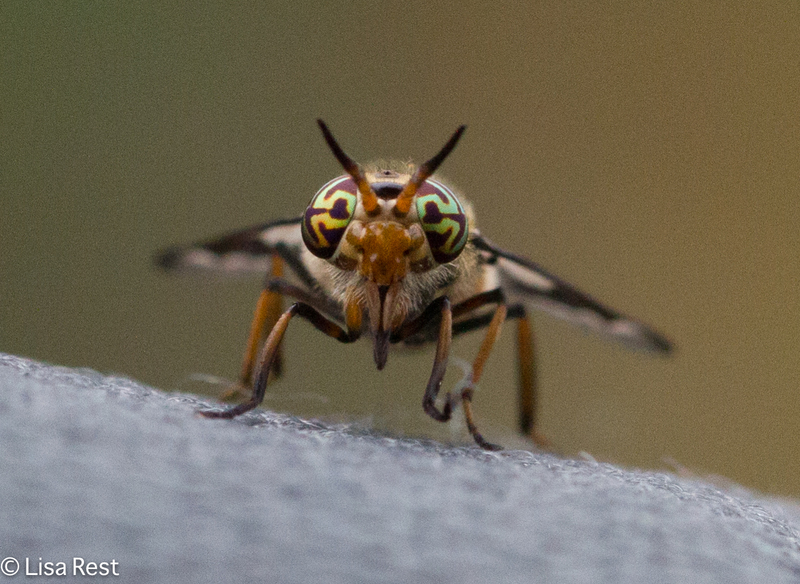 My what beautiful eyes you have. 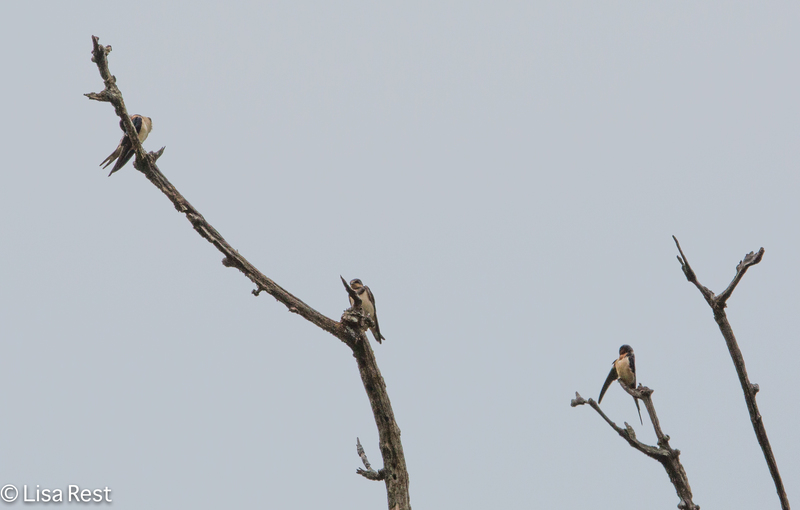 On the way back to the car, a few Barn Swallows taking a preening break. 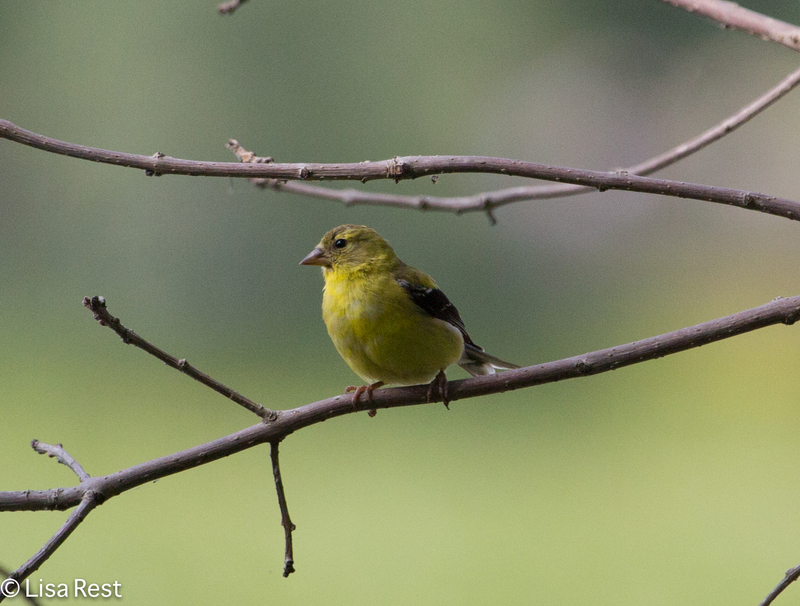 The American Goldfinch below is likely a juvenile male, if the faint darkness on his crown is any indication. Summer continues, although for the moment we’re having brisk fall weather. The days are still long but they get shorter and shorter, and every other week it seems I have to make an adjustment to the length of the timers on the lights in the house, so the indoor birds can see where they’re going during people hours. It turned out to be not quite as cold as predicted today, and the sun was shining brightly. 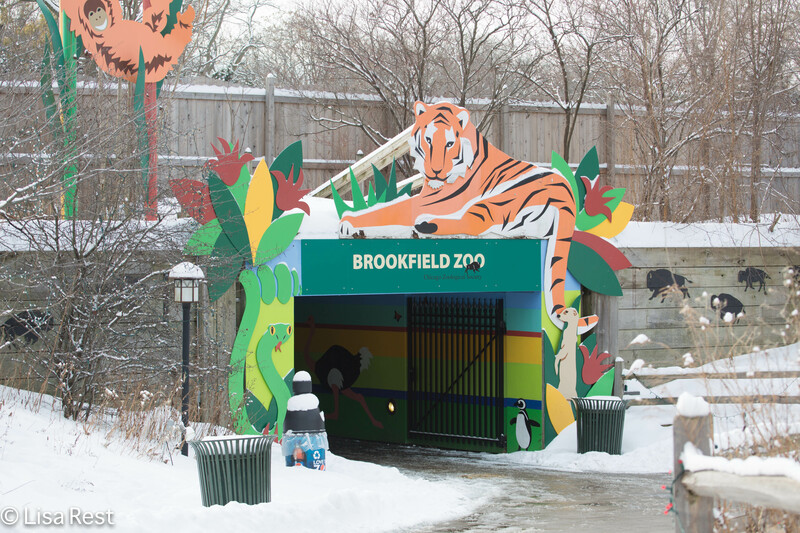 I was already thinking of going to Brookfield Zoo to see if there were any birds around the Wilderness Trail. I was not sure whether the Wilderness Trail would be closed off, but I knew the Zoo would be open. Their motto is “Open 365 Days a Year.” It was almost a shock a couple weeks ago when they closed with that first big snowfall that took us deep into our lasting arctic plunge. By the way, did anybody even pay attention to The Groundhog today? Sunny day, I knew he’d see his shadow. I’m afraid he was already eclipsed by the weather forecasters and the Super Bowl. You know it’s getting bad when even The Groundhog becomes obsolete. 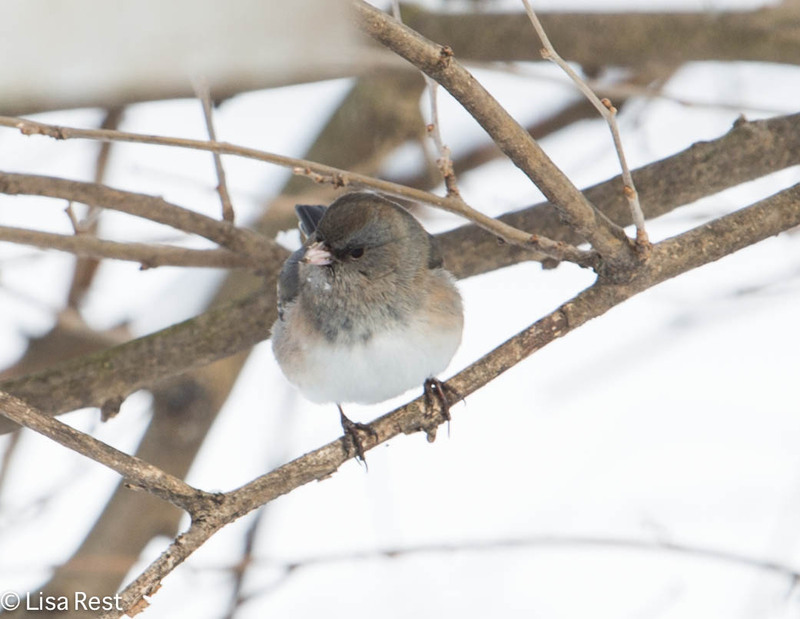 The Zoo doesn’t open until 10:00 a.m., so I had the early morning to feed the birds, unbury the car from yesterday’s snowfall which seemed more like 6 inches accumulation instead of 10, eat my oatmeal and play piano before I went. When I arrived around 10:30, there were perhaps a dozen cars in the parking lot at the North Gate. Admission was free today. I’m sure they did not want to pay the ticket takers if they expected few visitors. The Wilderness Trail is out behind the Great Bear Wilderness exhibit and borders the Salt Creek. It has been built around a small lake. The trail is never very crowded, but today it was totally empty, although someone had carved a trail in the snow before me. Not very many animals outside today. I had no intention of going inside, since I only wanted to walk the Wilderness Trail and the camera would not appreciate the transition from 14 degrees to 78 degrees. 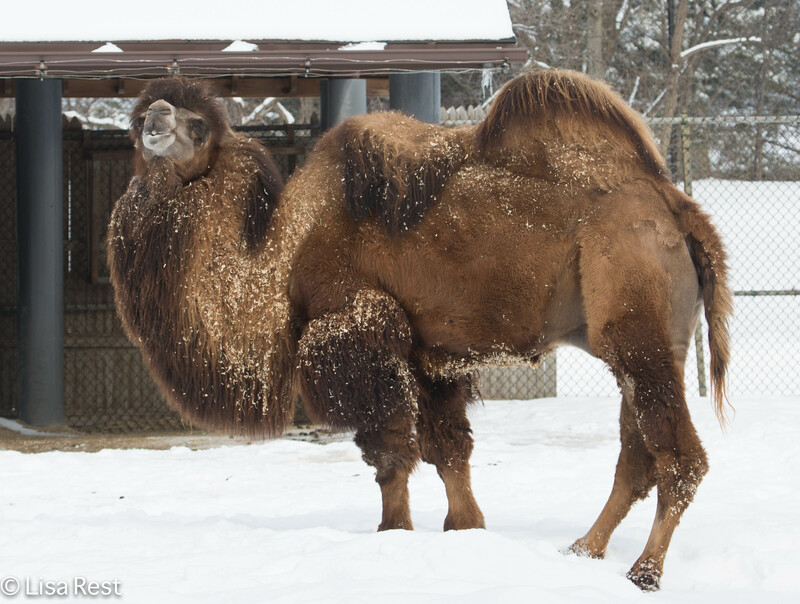 But on the way to the Wilderness Trail I encountered two camels in their outside pen, and while it seemed strange to see camels in the snow, these are Bactrian Camels, native to Mongolia, so I guess snow and cold are nothing new to them. They certainly seemed well-protected. 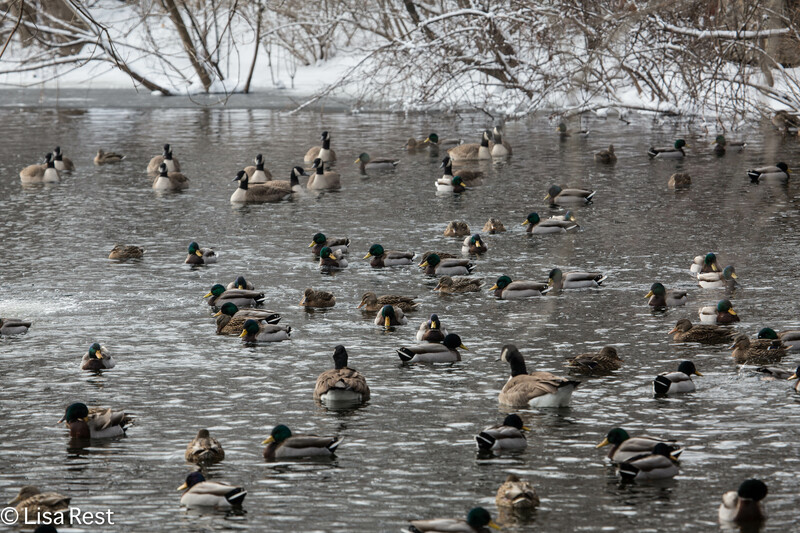 In warmer winters past, the shallow little lake attracts Northern Shovelers and Hooded Mergansers, but this year with only a small area of open water, there were only Canada Geese and Mallards. 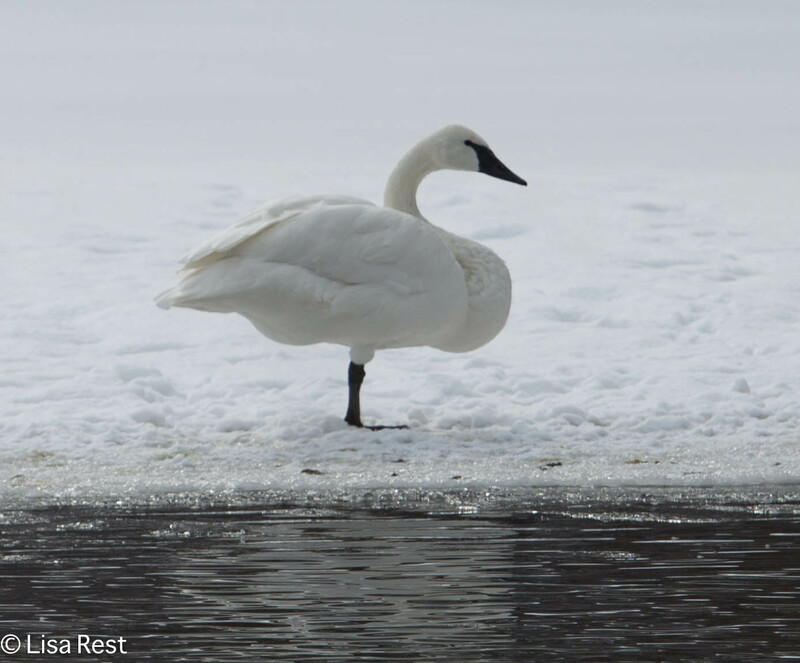 And the resident Trumpeter Swan put in an appearance standing on one foot on the ice at the edge of the water. 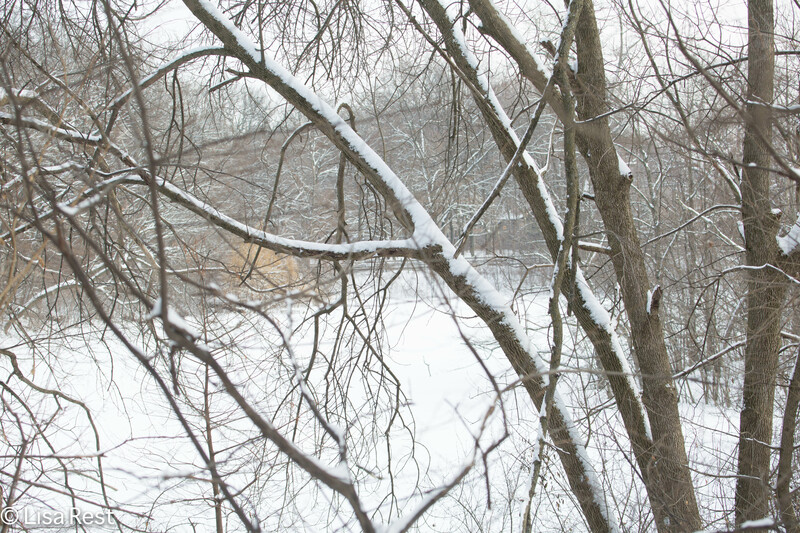 The rest of the small lake was frozen and covered with snow. 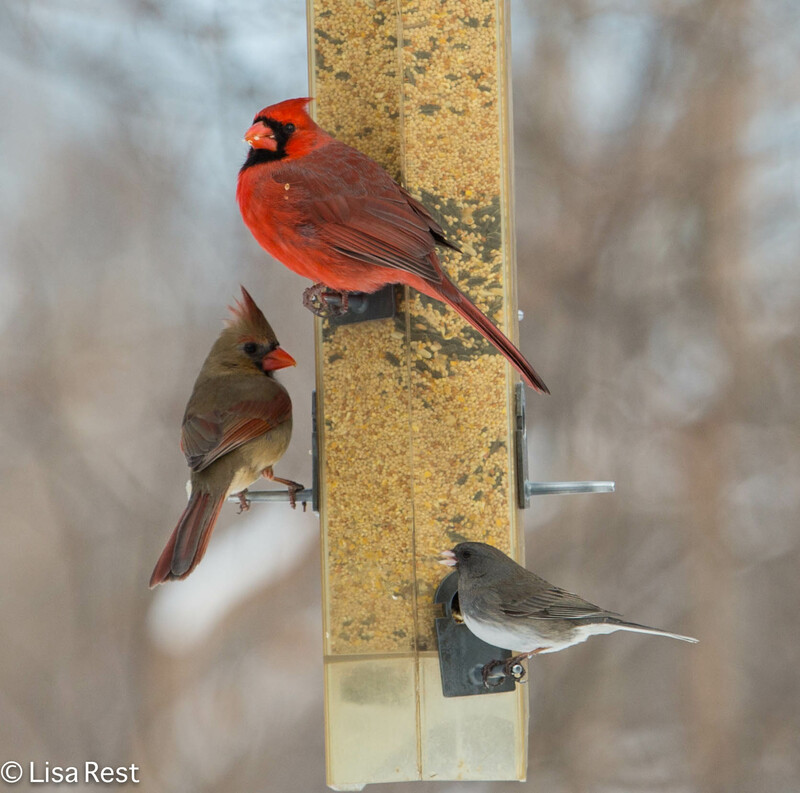 The feeders, on the Salt Creek side of the trail, attacked the usual suspects. 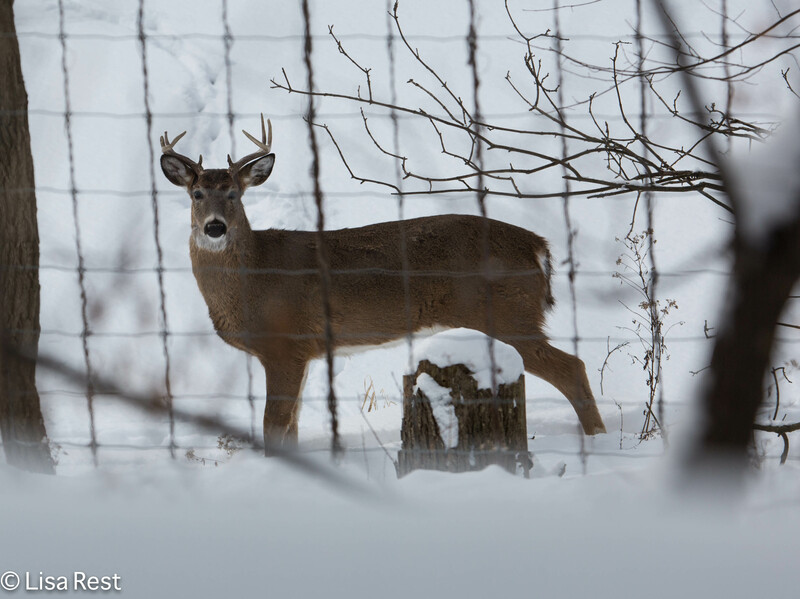 On the other side of the fence by the Salt Creek there were a couple young White-Tailed Deer. While the birds did not mind my presence, the deer were upset with my camera and kept moving ahead. 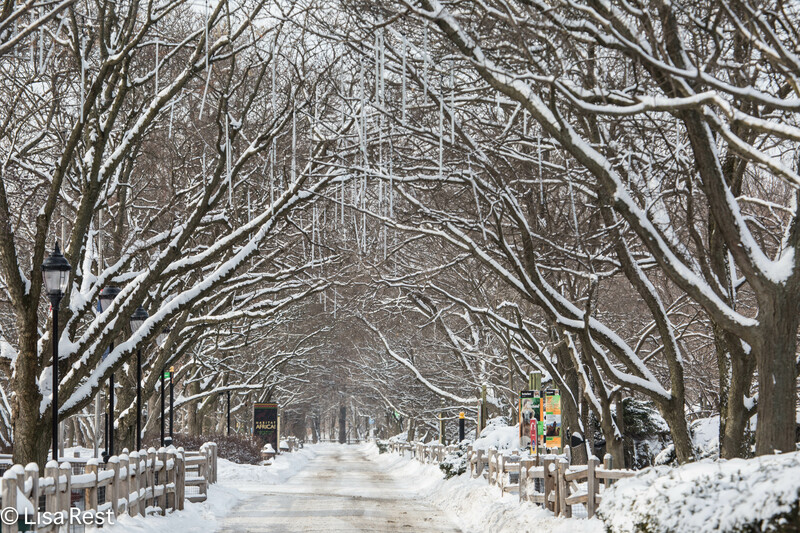 Overall my visit to the zoo was nothing spectacular, but it was good to be outside in the sunshine, and the pristine snow, as sick and tired as I may be of shoveling it, is still beautiful. Meanwhile, back in the birding world, there have been many White Winged Scoters reported on the lakefront. Tomorrow will be only slightly warmer than today, but sunny again. I will try to get out to Monroe Harbor tomorrow afternoon and see if I can find a White-Winged Scoter or two; while I’ve seen them before, it’s always been at a distance too far away to photograph. Anyway it’s something to look forward to. Sunday morning I was still too worn out from the Friday and Saturday to go very far, so I made a trip to Fullersburg Woods in DuPage County, closer to home. 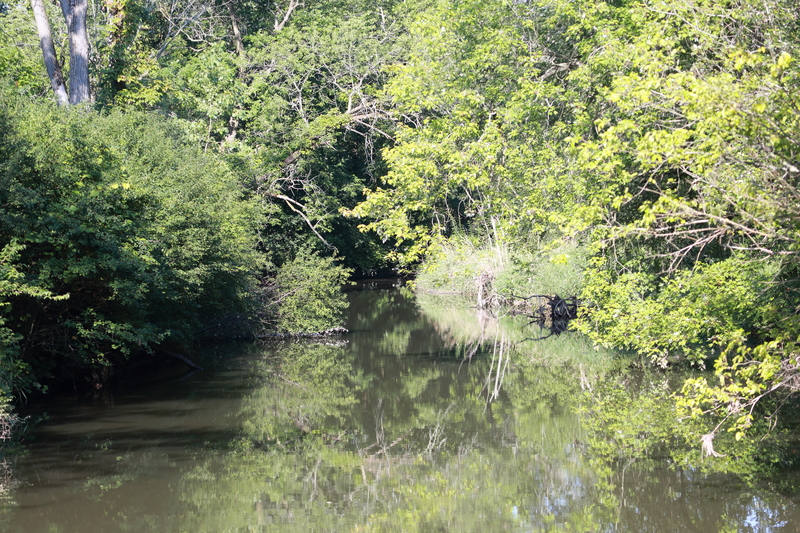 Fullersburg has a range of habitats and the trails are easy to navigate, but the focal point for me in summertime has to be the Salt Creek running through it. It’s a beautiful setting. 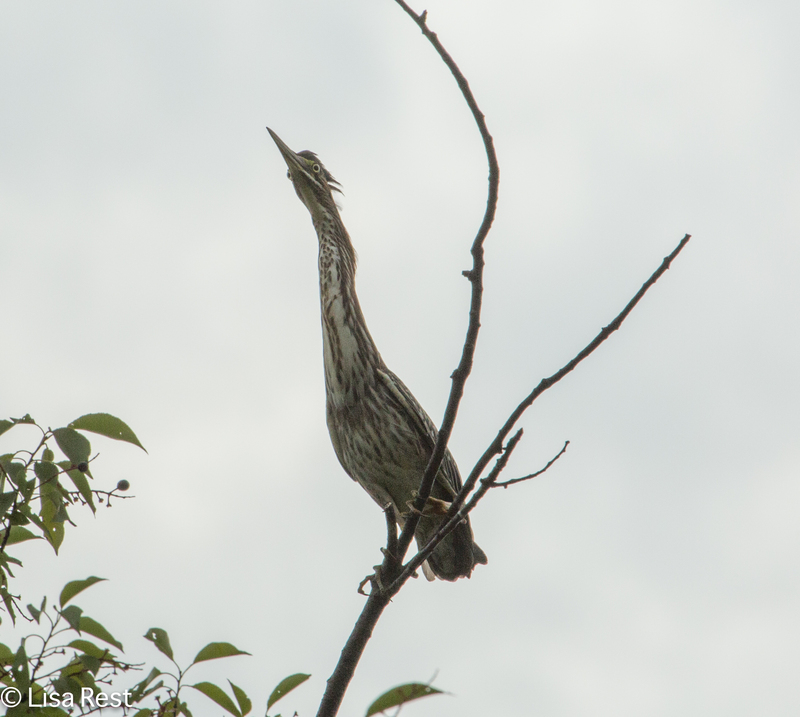 I did not expect to see very many species, but I thought perhaps I could get a little closer to a heron or two. 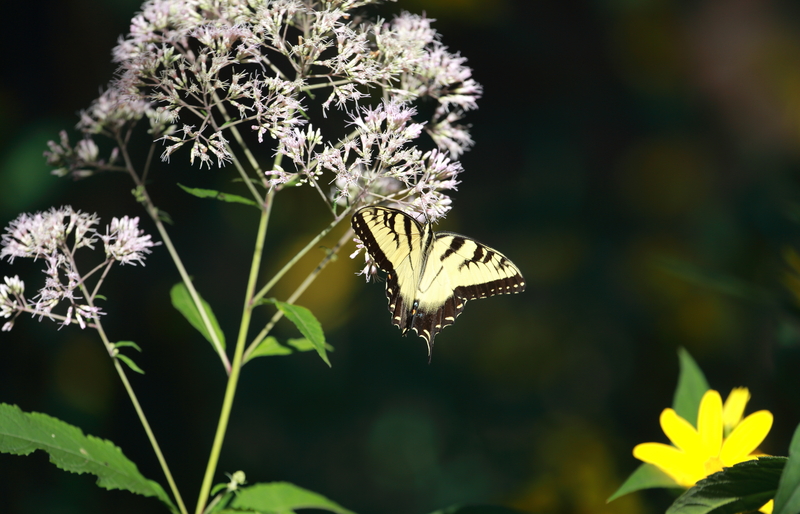 My first discovery was not a bird but a Tiger Swallowtail Butterfly. 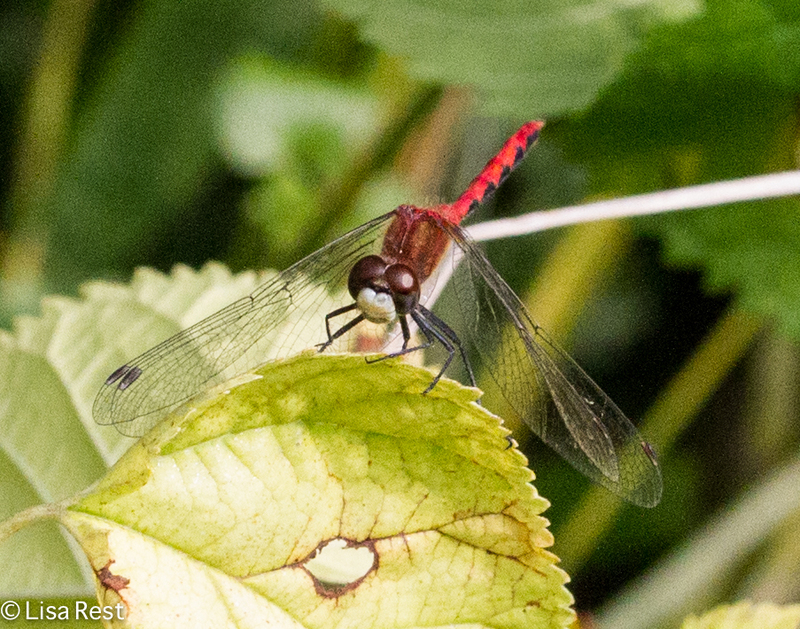 Butterflies are rarer sights this year. 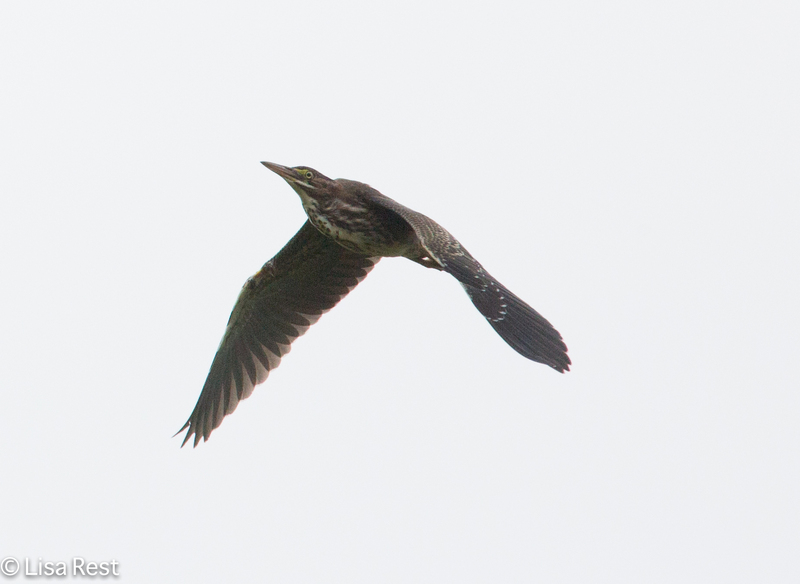 The herons did not disappoint. 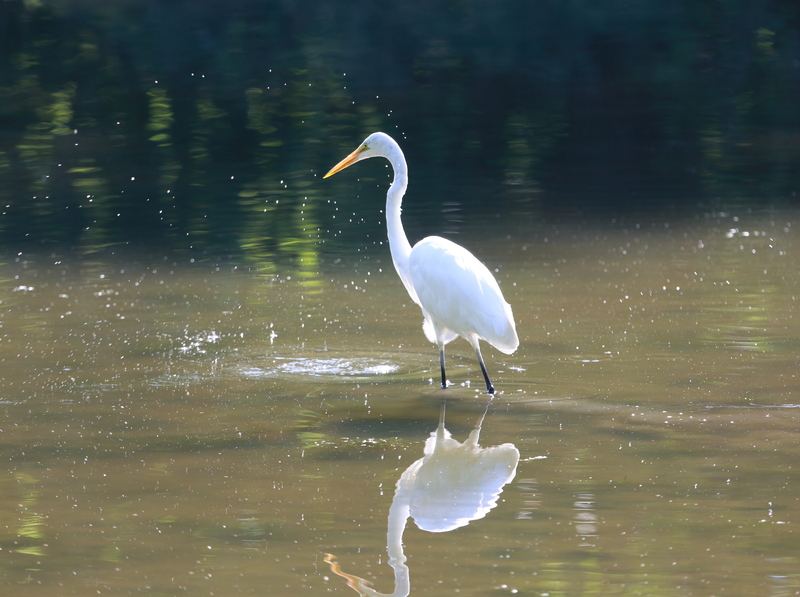 A few steps along the Salt Creek and I found a Great Egret who was more concerned about its catch than me taking its picture. 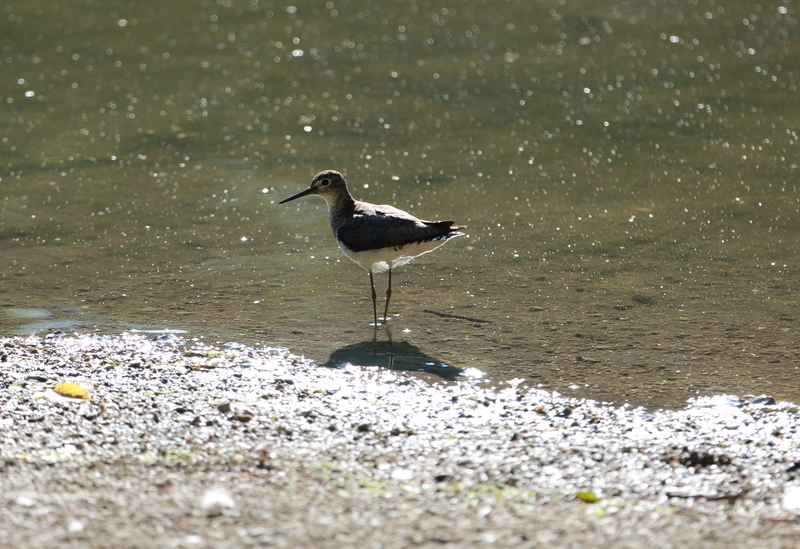 Same goes for a juvenile Solitary Sandpiper. Farther along, the birds were a bit less obvious. 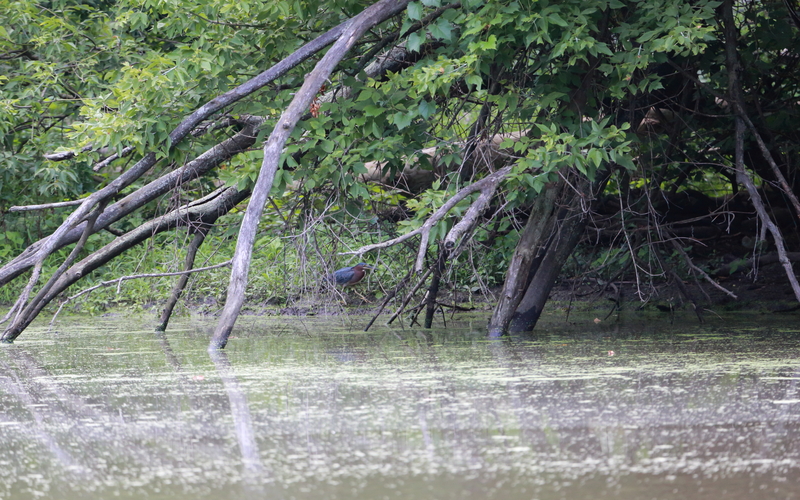 Click on the picture below to see if you can find the Green Heron. I caught up with it later at a much closer range. 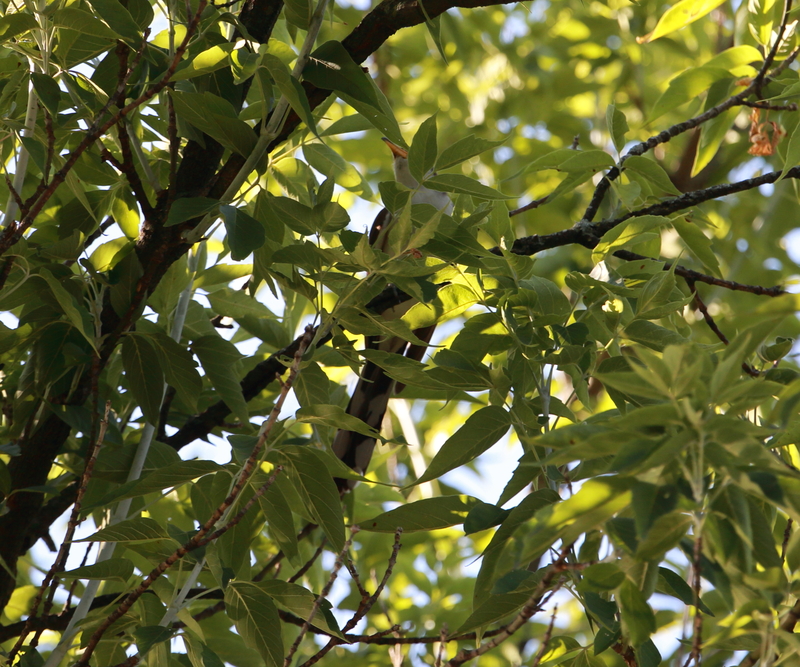 And now see if you can find the Yellow-Billed Cuckoo in the photo below. 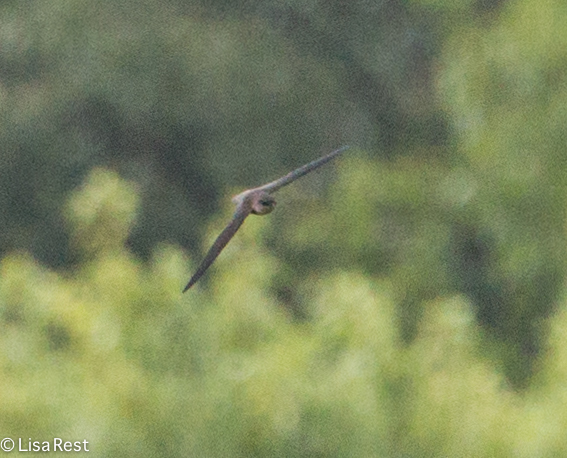 Yellow-Billed Cuckoo – where are you? 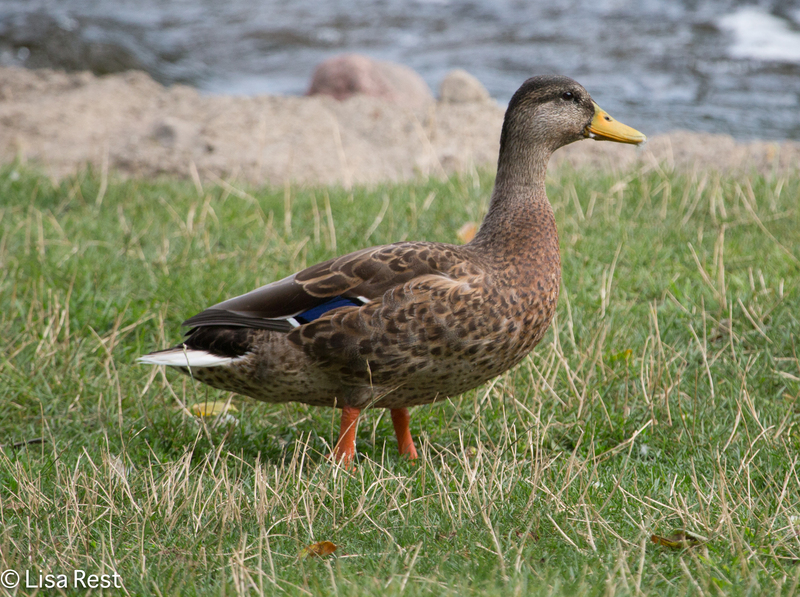 Mallards are always expected. These were catching morning naps. 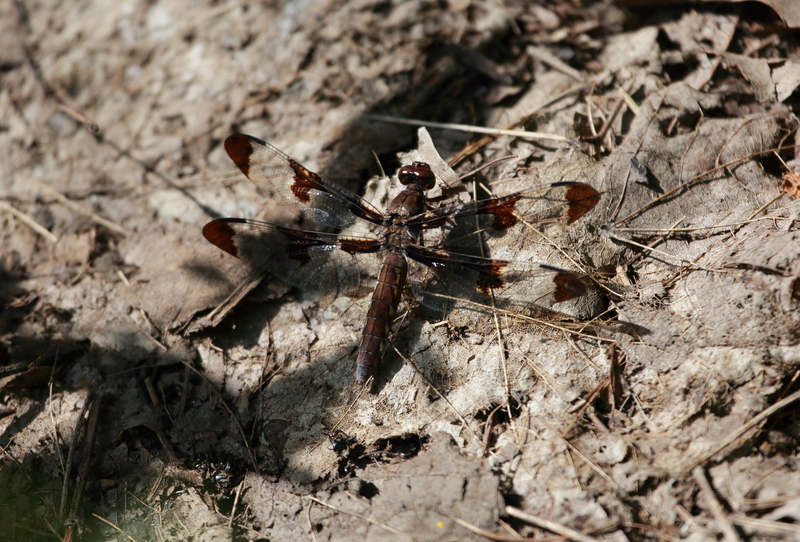 At some point this dragonfly decided it wanted to blend in with the trail right in front of me. 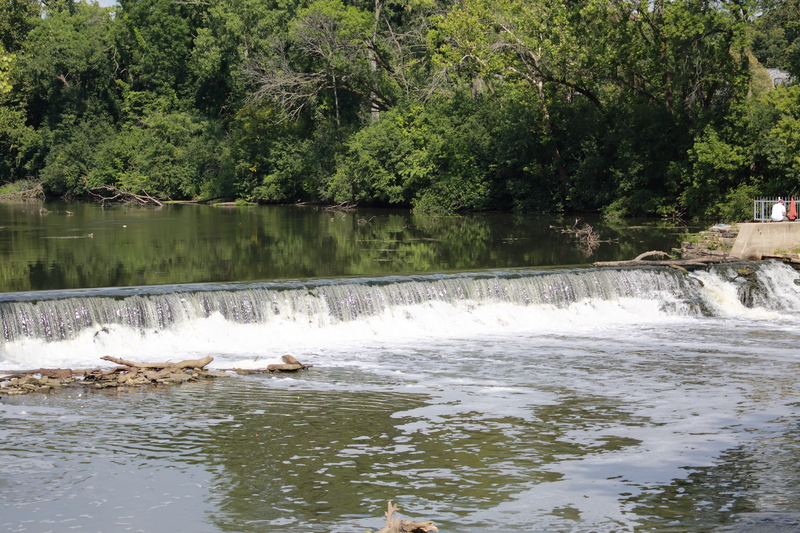 The trail that runs along the Salt Creek meets up with Graue Mill to the south where there is a waterfall which supplied the power to run the mill. 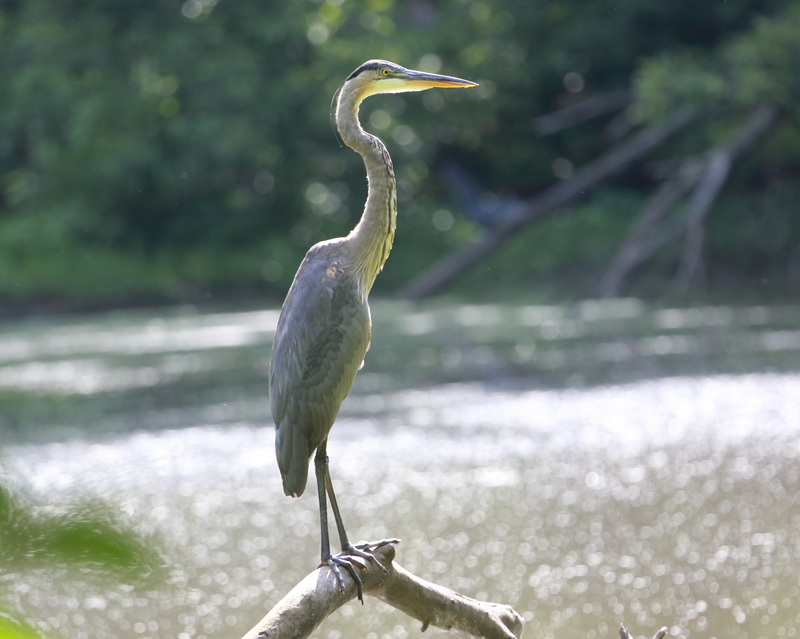 The Great Blue Heron that appears at the beginning of this post eventually became tolerant enough of my presence to give me the photo below. 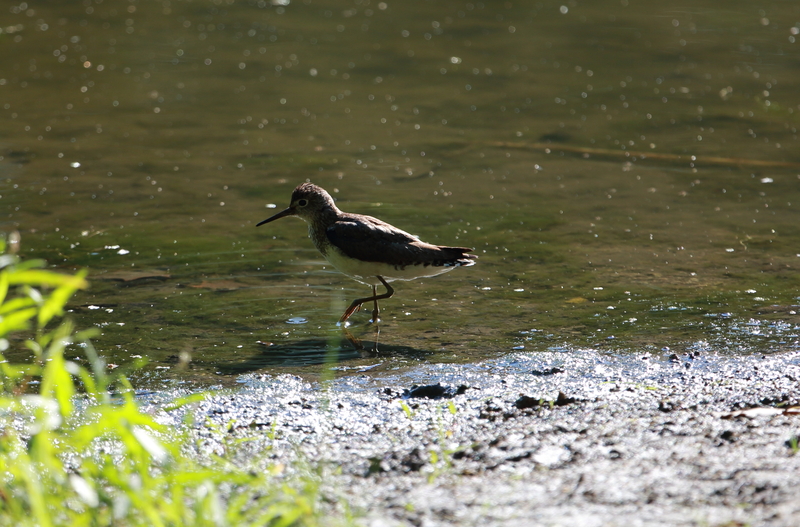 I then left him to continue fishing. The Chicago Portage has so much history it’s almost too much to think about. And yet if it wasn’t a historical landmark it probably would have been developed over by now. It’s adjacent to train tracks, the Chicago Metropolitan Water District, and Interstate 55, not to mention Harlem Avenue also known as good old Illinois Route 43. Instead of counting birds lately I find I’ve been keeping track of how many planes fly over while I’m wandering through; the Portage is also right in the flight path of Midway Airport. But the planes roar overhead and when they’re gone, the remaining traffic noise seems almost benign by comparison. 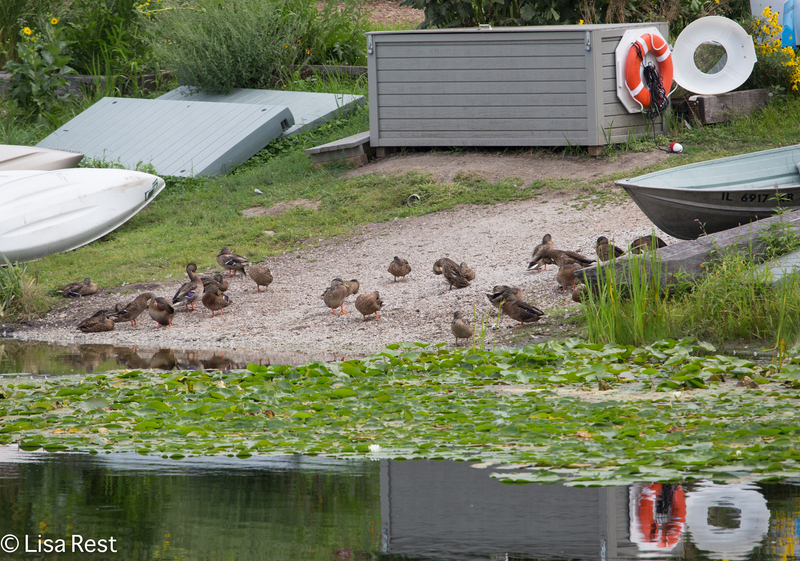 Whatever the ambience, there is still wildlife. I never thought of the duckweed as attractive, but this Canada Goose seems to be wallowing in it. 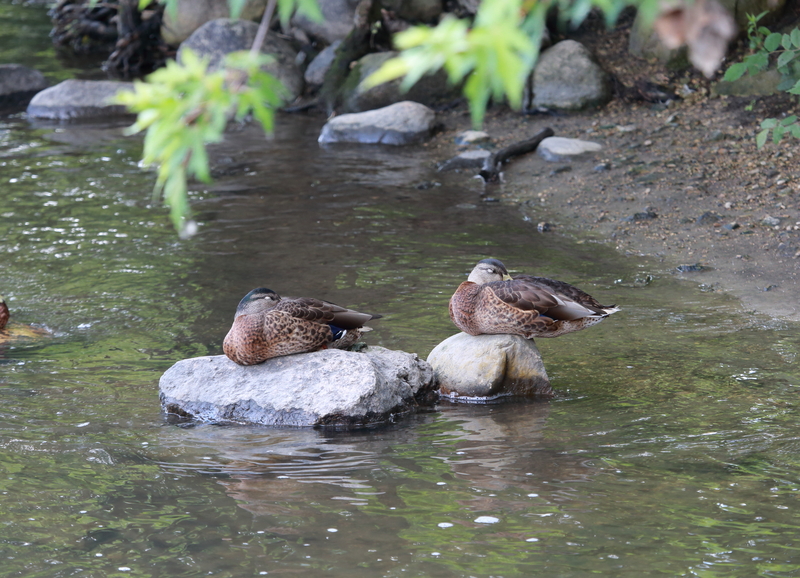 The pervasive scum lends a pointillist feel to the image of these Mallards below. 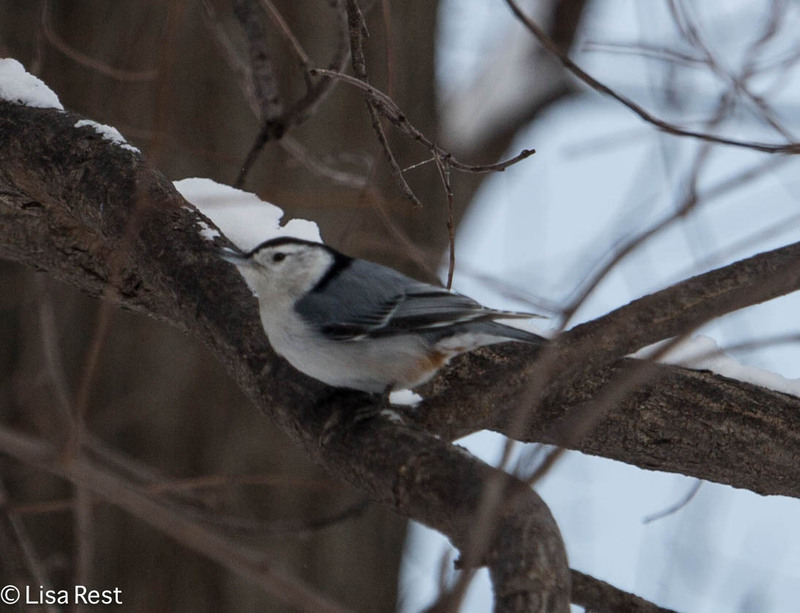 While I’m dabbling in impressionism, what about this Red-Breasted Nuthatch searching for hidden treasure in the dead leaves…? A Red-Eyed Vireo came out for the sunlight that traded off with the cloud cover all morning. 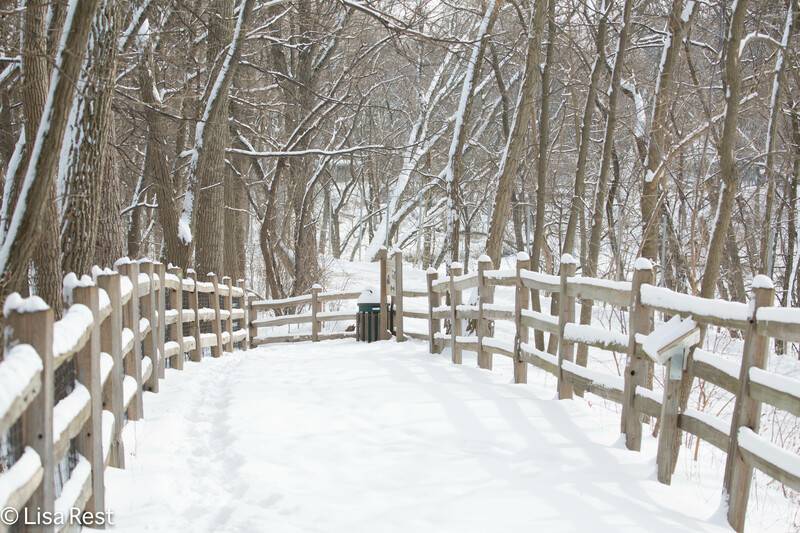 There are little story boards displayed in a few places along the trail at the Portage, and I think one of them has a caption, “if these trees could talk.” Sometimes the trees do talk – they creak, sway and moan. What’s left of this tree has an enormous web attached to it, catching debris. Finally, this Yellow-Bellied Sapsucker might be my favorite “painting” photograph, for the light on the bark and his back. Perhaps the attraction I have to the Portage lies in the stark contrast between its cluttered wildness and the manmade mess that surrounds it. Spring and all things new again, at the Chicago Portage. 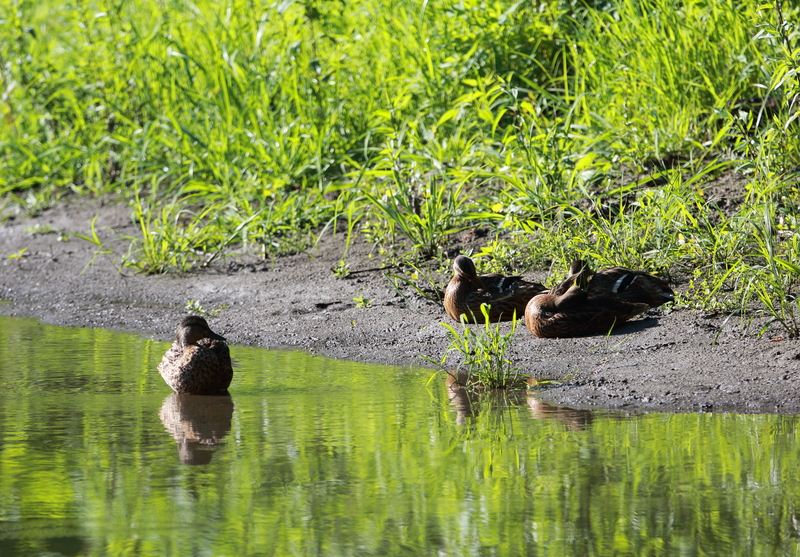 We’ve had enough rain to add water to the ponds and streams that otherwise appear dead with overgrown algae in the summertime because no water flows directly into them. Creatures manage to make a living off this place anyway. Lots of turtles sunning themselves. Yesterday was beautiful, cooler than it was last week but still quite warm in the sun. More birds heard than seen but when I arrived the Blue Jays were making a lot of racket, and I figured they’d be predictably hard to see. 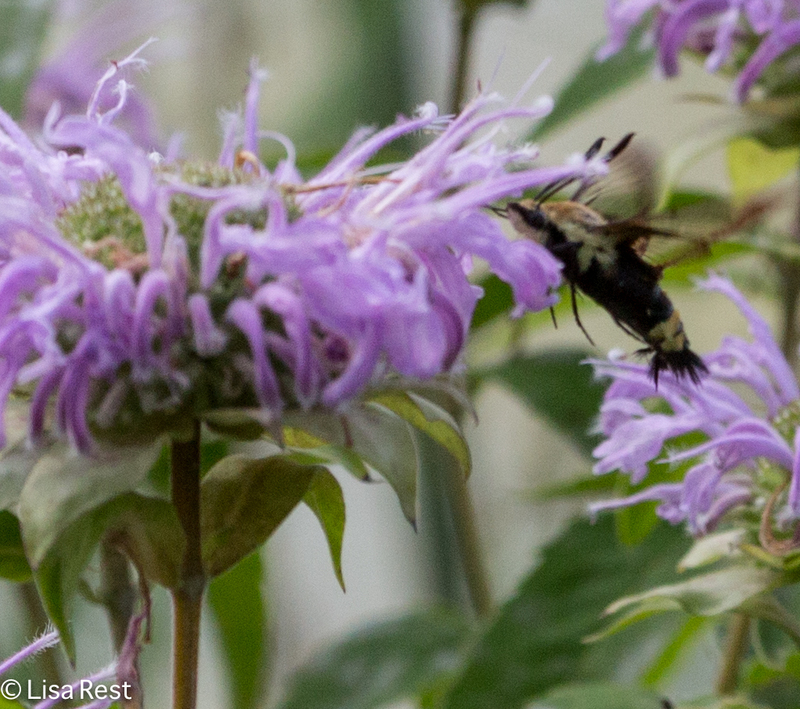 The butterflies were barely cooperative. I think these are Cabbage Whites. and I guess you could say the same for the Mallards. 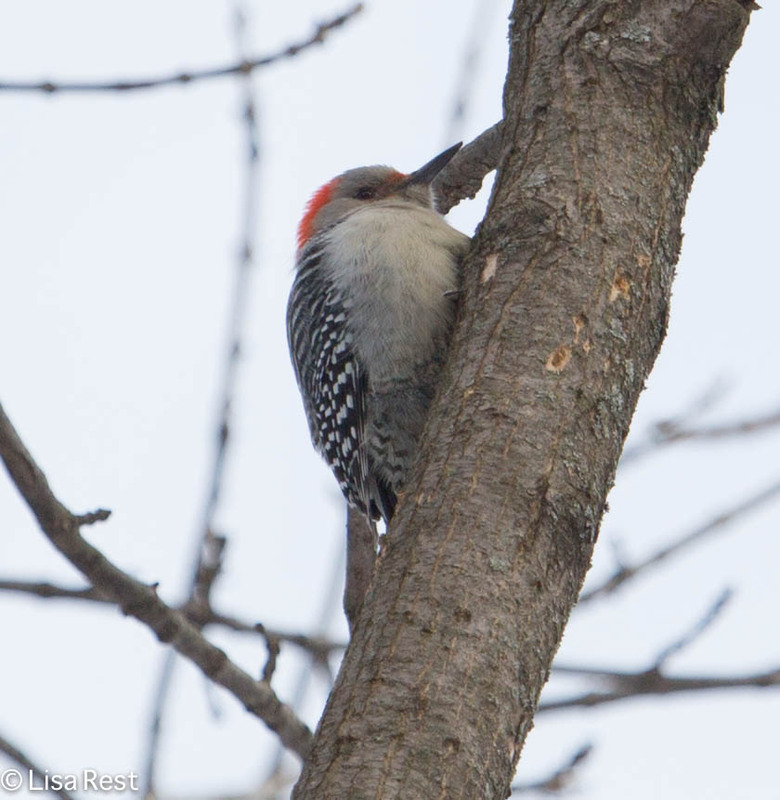 There were several Northern Flickers, for the most part flying away, but I managed to catch this one off guard. And my reward at the end of my walk was a Blue Jay who didn’t seem to mind my presence as long as he could hide behind a twig. Here he is a little less twiggy but not quite as blue.